Edinburgh Designs has developed a suite of software tools specifically for running experiments in a wave tank. Wave Synthesiser allows the user to specify, using a graphical interface, the waves to be used in an experiment. 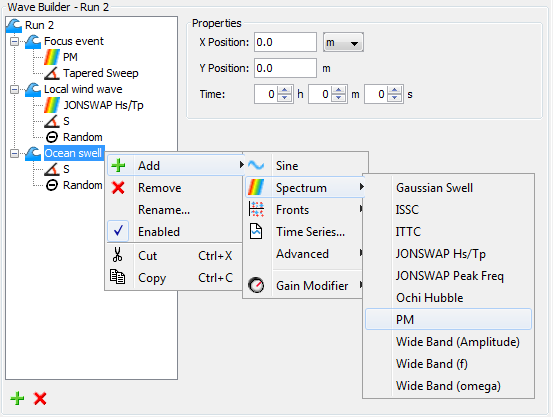 The software then outputs the wave data in an open XML-based file format optimized for loading into Edinburgh Designs’ Wave Runtime, from where it can be run in a wave tank. Wave data captured from wavegauges can be fed back into the software to be analysed and, if necessary, to correct for tank effects in the generated wave. 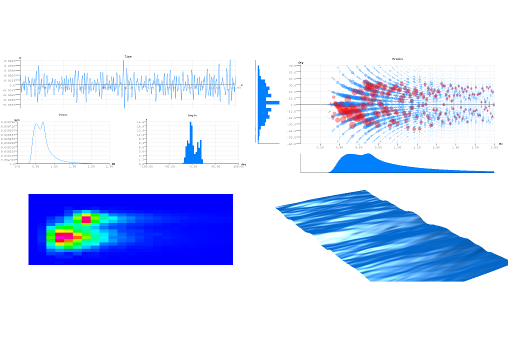 Wave Synthesiser is a graphical tool for designing wave experiments and analysing the data captured from wavegauges. Wave Runtime takes the files generated by Wave Synthesiser and controls the actual wave machine and wavegauge hardware itself via a USB interface. Easy to use: driven by a graphical interface with built-in library of commonly-used components. Although stand-alone, it fully integrates with Edinburgh Designs’ Wave Runtime. Customisable by the user, providing total flexibility and the ability to handle unforeseen future demands. Graphical visualisations to aid verification and scenario design. Integrated wave synthesis and analysis. Designed for Edinburgh Designs equipment, but can be adapted to drive other wave tanks. Replaces Edinburgh Designs' previous wave synthesis language: OCEAN. Wave Synthesiser functions by using the sum of individual sine waves, or fronts, to create complex seas. A front is defined by frequency, amplitude, angle and phase. Multi-spectral seas are generated by summing individual wave fronts generated by a user-specified mathematical expression, and then angle and phase are set by modifier components. Focussed waves for simulating extreme events. Complex composite waves with multiple merged sea states. Special effect waves, like quilt or bullseye patterns. Any combination of waves, for example an irregular sea state combined with a focus event. Waves are constructed by adding generator and modifier components to a tree structure. Any number of components can be added to a single run, providing unlimited flexibility while maintaining a simple interface. Components are defined by mathematical expressions, which can be added to or edited by the user to meet their specific needs. Wave Synthesiser also provides live on-screen graphical visualisations of the wave being created. These visualisations allow the user to quickly verify that the input parameters are correct before running the wave in the tank. Use of the Dalrymple method to generate angled waves at any position in the tank by utilising reflections from the tank walls. Correction for tanks with variable depth. Choice of units, including both metric and imperial. Ability to set up parameters for automated batch mode operation. Gain correction import to correct for differences between measured and predicted wave. Real-time control of wave generation hardware via USB interface. Runs waves generated by Wave Synthesiser, or by a built in sine generator which can be adjusted on the fly. Automated operation for unattended experiments or demos. Synchronisation with other lab equipment via digital inputs and outputs. 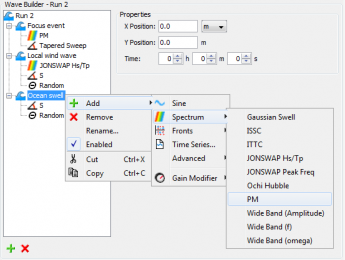 Capture data from wavegauges and wave generators. View detailed diagnostic information on wavemaker hardware for troubleshooting. Remote operation: graphical interface can be run remotely over a network connection. For further information contact Edinburgh Designs on +44 131 662 4748 or email us.